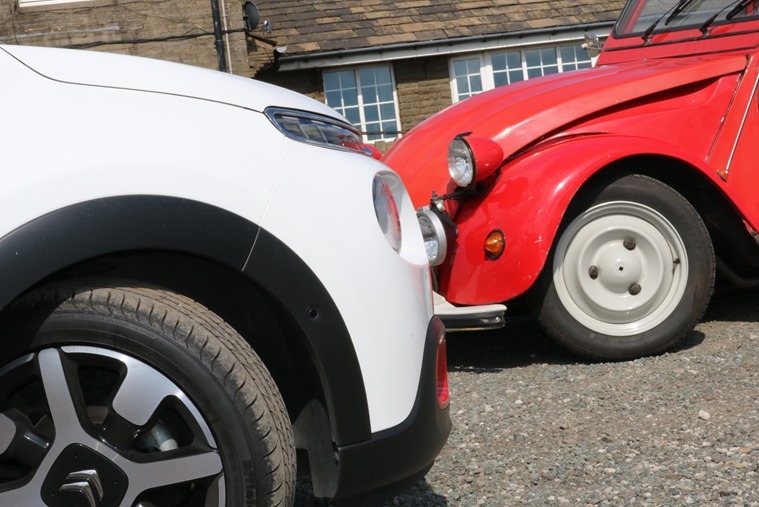 Take a look in any car park or on any street, and you’re guaranteed to see hordes of Beetles, Fiat 500s and Minis. It would appear retro is very much en vogue, as far as small European cars go, at least. There’s one small European vehicle missing from this renaissance though, and that’s the Citroen 2CV. 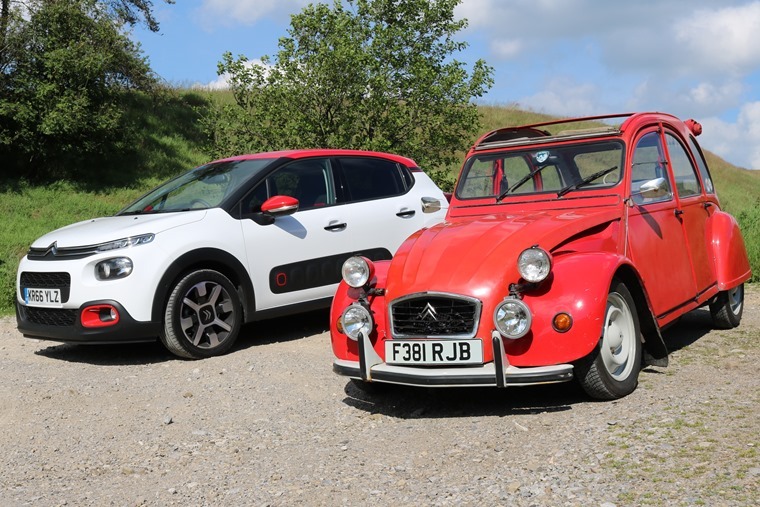 Its mammoth 42-year production run ended in 1990, and since then Citroen has launched numerous small, keenly priced cars that took up where the iconic 2CV left off. 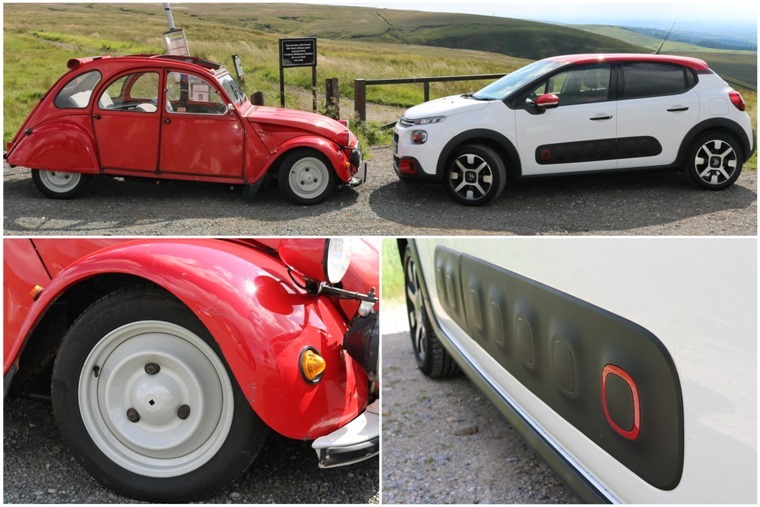 Each time a new small Citroen arrives, people ask “is this the new 2CV”? And the answer has invariably been no – none of them have been, so we should probably stop asking the question. 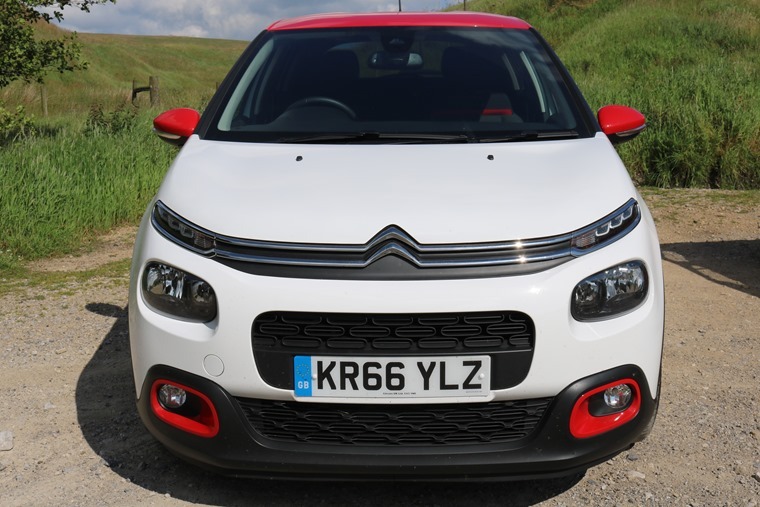 Which brings us nicely on to its latest small car – the new C3. We liked it so much it won our Supermini of the Year Award thanks to a stand-out design and some very appealing lease rates, and we recently had the chance to drive it back-to-back with its aged ancestor. 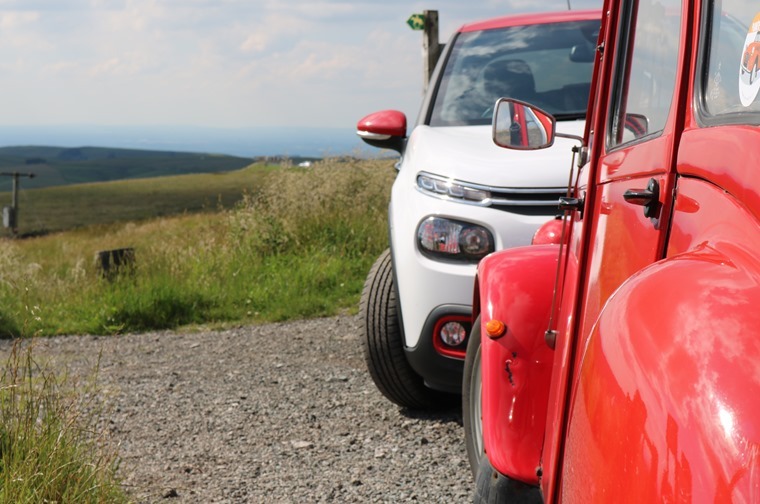 Let’s be clear from the off though – the C3 isn’t any sort of “new 2CV”, and we aren’t treating it as such. After all, stacking a car designed before the second world war against a tech-filled supermini of 2017 is a bit like comparing a gramophone with Spotify. We did however think that there’d be no harm in putting them side-by-side, for some pretty pictures if nothing else. Let’s start on the outside. Unlike the curvy C3 from the early 00s, there’s not even a hint of nostalgic 2CVness in the C3’s lines. Instead you’ll find all of Citroen’s newest design cues, notably those “Airbumps” and the same chunky front end appearance as the C4 Cactus. This look is set to feature on the upcoming C3 Aircross too, so it would appear it’s here to stay. It’s actually quite refreshing; not just compared to more mundane-looking hatchbacks, but also in the face of the retro-fest we’ve seen in recent years – you’ll stick out like a sore thumb in a sea of Fiat 500s, anyway. Unlike the curvy C3 from the early 00s, there’s not even a hint of nostalgic 2CVness about the new car's lines. Comparatively, much has been said about the 2CV’s appearance over the years, and despite being one of the most recognisable vehicles of all-time, it still endures a host of unflattering nicknames: The tin snail, ugly duckling, upside-down pram – you get the picture. No paint-protecting plastic airbumps here. It’s lucky then, that there’s not much there to protect. Marginally thicker than your average biscuit tin, it’s the 2CV’s lightweight, less-is-more approach that results in that instantly recognisable silhouette. This austere nature becomes even more apparent in the cabin. 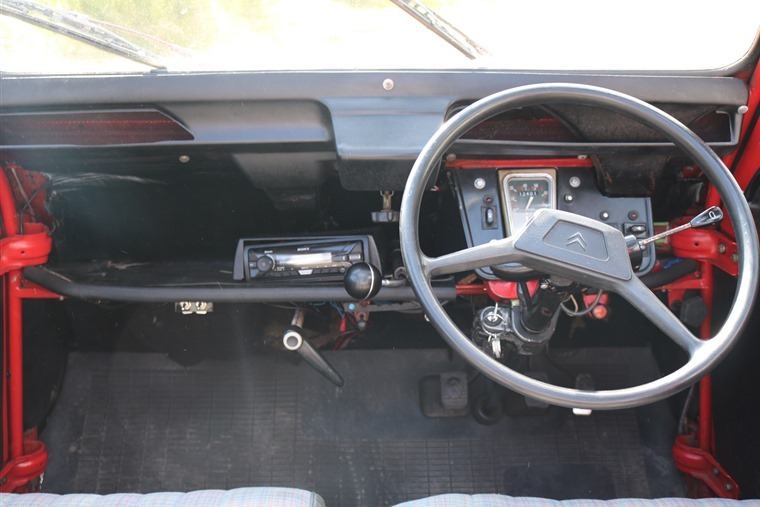 Things are seriously spartan with not much more than a speedo, fuel gauge, assorted switches and a rudimentary heater for company. It’s the 2CV’s lightweight, less-is-more approach that results in that instantly recognisable silhouette. Despite the lack of creature comforts, it’s a supremely comfortable place to spend time thanks to an innovative suspension which, along with the DS, bestowed Citroen with its world-class reputation for ride quality. This is a virtue that lives on in the C3 and, while it isn’t an ingenious suspension set-up that ensures top ride quality, armchair-like front seats make sure it sees off the competition when it comes to outright comfort. 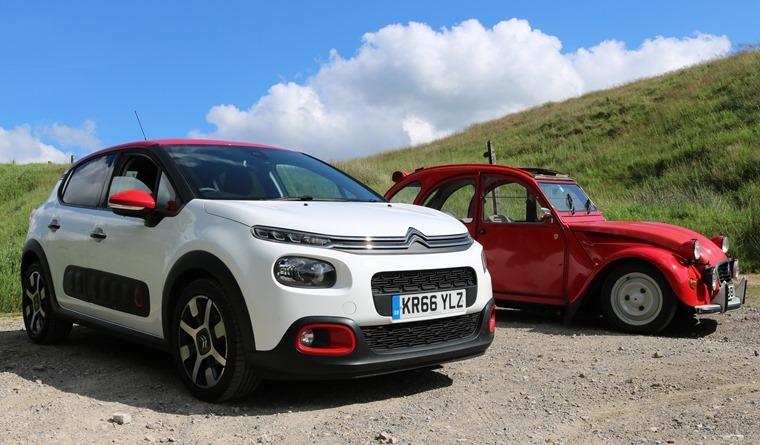 Citroen's famed comfort is a virtue that lives on in the latest C3. 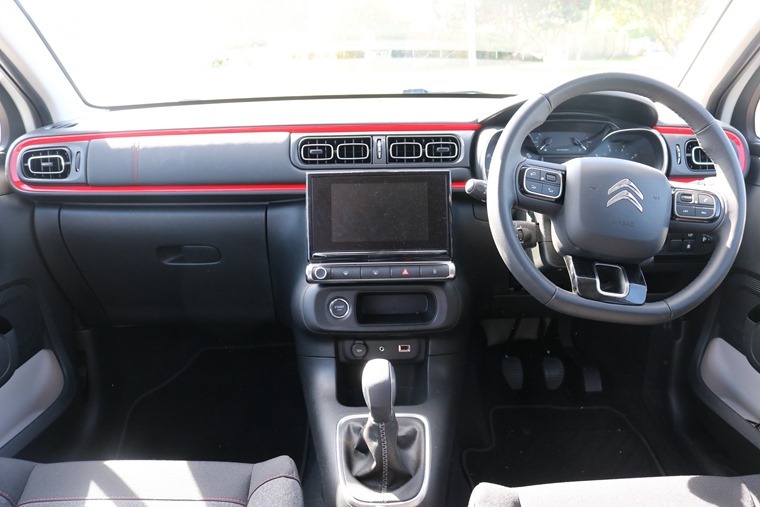 Aside from being a comfortable place spend time, Citroen has tried hard to differentiate the C3’s interior from the usual drab affair you’ll find in some of its rivals. Features like leather door pulls and oblong air vents are a refreshing change from the norm. And this is where it gets a bit silly, mainly because in the tech stakes, the two cars couldn’t further apart. Yes, the 2CV was a powerhouse of avant-garde design, but these days people are more keen on infotainment and safety equipment than they were during the 2CV’s 40-year tenure. The 7in touchscreen in the C3 controls the majority of the car’s functions, and while it’s a little fiddly you soon get used to it. With the likes of satnav, voice command as well as Android Auto and Apple CarPlay, the C3’s system is as up to date as they come. 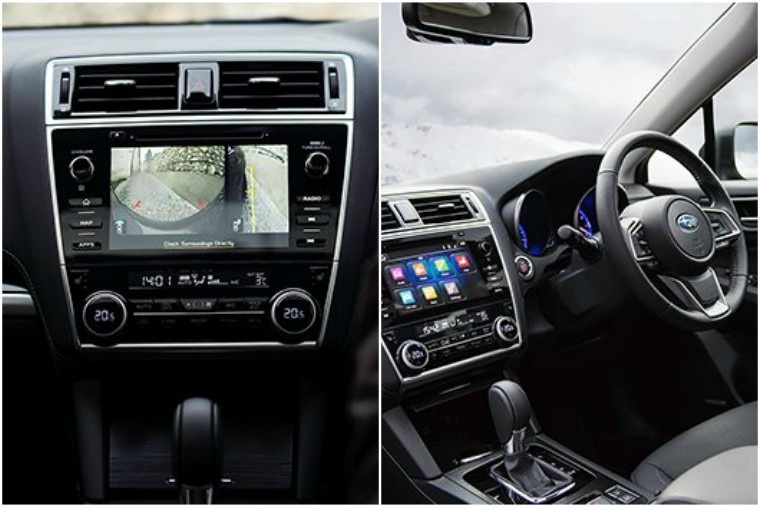 Swipe your way through the menus and you’ll discover you’re well connected – it comes with its own wifi system and even a clever camera in the rear view mirror for taking photos and dashcam footage. By comparison, the 2CV is about as connected as a tin-can telephone. It comes from a time before radios were standard fitment on many cars, and even the pictured car from 1989 makes do with a rather primitive aftermarket sound system. As for “air con”, well, you’ve got two options – there’s a large vent flap under the screen for starters. Still not cool enough? Then you can peel back the full-length vinyl roof. Driving the cars back-to-back is a perfect demonstration in how much easier cars have become to drive too. The 2CV has a manual choke (remember those?) and a gearbox that takes some getting used to. With a flat-twin two-cylinder 0.6-litre engine offering up less than 30bhp, top speed is rather dependant on which way the wind is blowing and how many passengers you’re carrying, but it is guaranteed to put a smile on your face. The 2CV's top speed is rather dependant on which way the wind is blowing and how many passengers you’re carrying. That’s something that few new cars – no matter how much power they offer – can muster. Its near-30 second 0-62mph run might sound laughable, but provided you drive it like you stole it (that’s to say flat out, everywhere), it’ll keep up with the majority of modern traffic no problem. Step into the C3 from the older car and you’d be forgiven for thinking autonomy is already here. Keeping a 2CV going at a reasonable pace requires effort. As you’d expect, the C3 is easier to drive in all regards, with this 1.6-litre diesel test car providing all the torque a small hatchback could possible need. 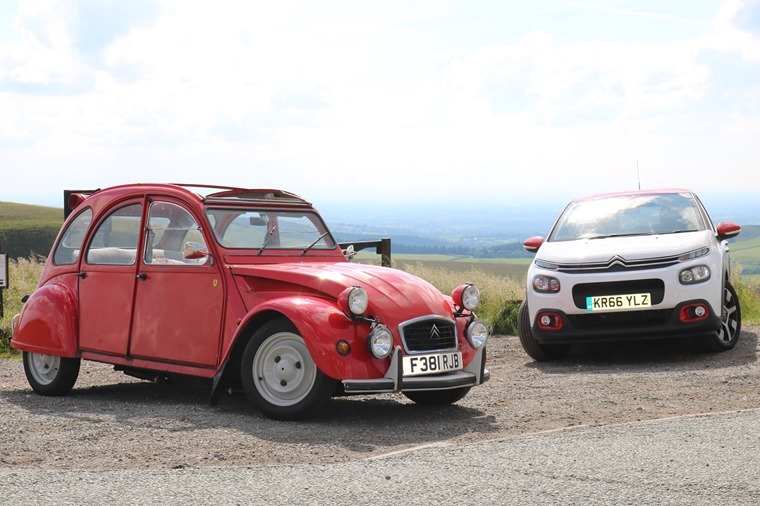 The 2CV was frugal in its day, but the C3's engines give it a run for its money when it comes to MPG. That said, fitting diesels of that size in superminis is generally falling out of favour, so the range of petrols would probably be a better bet and, while the 2CV’s tiny engine was renowned for its frugality in its day, all the C3’s offerings will give it a run for its money when it comes down to pure MPG. 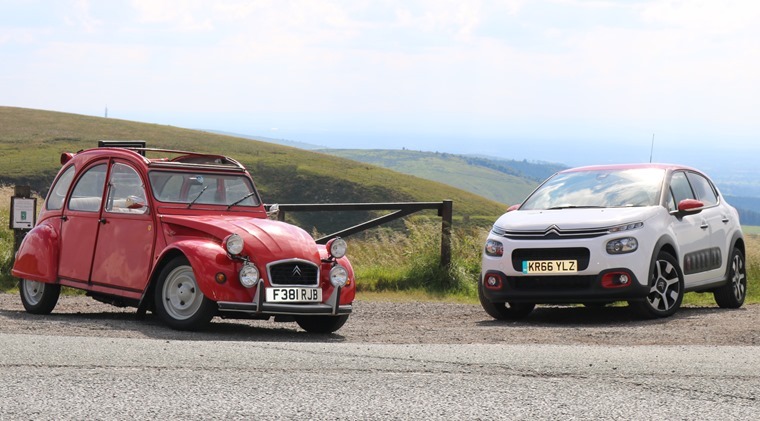 So let’s get back to that rather pointless question: can you describe the C3 as a new-age 2CV? In a word, no. Nothing has truly filled the 2CV’s shoes since it went out of production, and Citroen knows this all too well; the AX wasn’t, the Saxo definitely wasn’t, the original C3 wasn’t and this one isn’t either. But it’s not trying to be, because to create a modern-day interpretation of the 2CV would be nigh-on impossible; it remains so unique by design that compared to those aforementioned Minis and Beetles – which are really just re-bodied Pandas and Golfs – it’d be a shame to plonk some new-fangled 2CV body onto a rather ordinary platform. Citroen understands this, so instead of relying solely on its past for inspiration, with the new C3 it has successfully done what it’s always been rather good at – offering something different. 922 litres (seats down) Basket of eggs, baguettes, garlic, assorted French bric-a-brac etc.